3.5 Ways to Save Without Giving up Anything. Two economic indicators were released today, personal incomes and personal spending. We learned that consumer incomes were up slightly, however consumers were not spending that extra money, even with lower energy prices. Unfortunately, while putting away more money is great news for individuals, it is bad news for the economy, considering that the large portion of our GDP is based on consumer spending. Since Maks Financial Services’ responsibility is to you individually , and not the economy as a whole, here are 3.5 more ways of saving money, without actually cutting things back. What do credit cards have to do with a cash reserve strategy? As a financial planner, I am frequently asked about credit cards, and what someone should do with credit cards that they no longer use. After running across this topic on a credit card forum, I decided it was time for a post. People will debate about the reasons to keep credit cards open, including using them for emergency spending, instead of or in cases of no emergency funds as part of a holistic cash reserve strategy. Credits cards are not emergency funds. 100% correct. However credit cards MAY be the solution for the large part of America that does not have enough in savings. Let’s examine how credit cards and other credit products may fit as part of a holistic cash reserve strategy. Is Cheap Oil Good for America? We had a really interesting discussion at the office today regarding the low oil prices and whether it was a good or a bad thing for the United States. When I heard the same conversation hotly debated on CNBC on the drive back from a meeting, I knew it was time to write about it. So what do you think? Is it a good thing or a bad thing? In the short term, I believe it is a good thing, a good thing for consumers. Time and time again we have evidence that lower oil prices, and thus lower gas prices, leave more money in the wallets of families to spend. The United States is not a nation of savers, but rather spenders, especially around the holidays. Only in the states will you be gently jostled by your friends and coworkers because you have the iPhone 5 and not the iPhone 6 plus. Lower energy prices will no doubt increase sales and the bottom line of retailers. Lower oil prices are also good news for airlines, cruise ship operators, industrial producers and other manufacturers. Their input costs will go down, and thus raise the profits for the shareholders. Once again, there are little doubts that this will be a positive catalyst in the short term. Had enough fun? Was it more fun watching the ball drop on New Year’s Eve or watching our politicians fumble the ball all the way through to 2013 as they played with our financial futures? The good news is, we finally have a resolution to the biggest question mark we faced heading into 2013. While politicians hoped to have a grand bargain resolution for the overall shebang, the most we got was the urgent stop gap. Instead of treating the gunshot patient, they merely stopped the bleeding, put some stitches in, and told him to come back in 2 months. In any case, from the financial planning aspect, we now know what laws and taxes we have to work with and abide by. So… what do we know? No changes for those making under $400,000 individually or $450,000 as a family. Increase from 35% to 39.6% on incomes for those making over $400,000 (s)/ $450,000 (f). Limits on itemized deductions starting at $250,000 in income. Phaseout of Personal Exemptions above certain incomes. Permanent fix for the AMT (Alternative Minimum Tax) which will now be indexed for inflation annually and affect people starting at $50,600 in income. 5 year extensions for College Tuition Tax Credit, Earned Income Tax Credit, and Child Tax Credit. Extension and now made permanent the 0% and 15% Long Term Capital Gains and Qualified Dividends tax rates for those in the lower tax brackets. New 20% tax rate for Long Term Capital Gains and Qualified Dividends for those in the new 39.6% Tax Bracket. As previously discussed, those making $250,000 and above will also be subject to an additional 3.8% Tax on investment income to pay for ObamaCare. Permanent Fix for the Death Tax. The current $5 Million dollar exemption made permanent, which will be indexed to inflation. The Death Tax rate will be going from the current 35% up to 40%. Increase of the maximum contribution limits to $5,500 for those under 50, and $6,500 for those over 50 years old. The 2% Social Security Payroll Holiday was let to expire. This was a tax cut we have enjoyed for the past 2 years. With the lapse of this tax cut, taxes are going up on approximately 77% of the population, essentially anyone with a job. This is estimated to cost the economy approximately $110 Billion. The emergency unemployment benefits program has been extended for an additional year. This bill in essence is a permanent extension of the Bush Tax Cuts for those making under $400,000, with a few much needed financial planning fixes. This bill, by design DOES NOT address the national debt limit and the fiscal waste expenditures. This bill also DOES NOT cut any federal spending, merely increases our National Debt by $4 Trillion dollars over the next 10 years as per the CBO. The fiscal cliff cuts in spending were pushed back 2 months. This will coincide with when the United States is going to max out it’s credit card again (hit the debt ceiling), where we will have a real tough battle of the nerves, with both sides standing their ground. Republicans want real spending cuts before they increase the spending limit, and Obama does not want any spending cuts tied to the increase of the spending limit. Next Showdown will be end of February. The sequel will then be March 27th, when the Government will be forced to shut down (maybe we will save some money, we currently spend $6 to $10 Billion dollars a day), because the Government Funding ends. 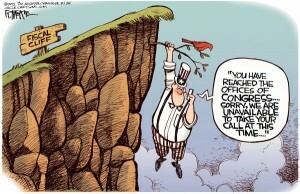 In short, the “Fiscal Cliff” was just one issue we were facing. Congress and the White House had over a year and a half to deal with this issue, but let our government go over the cliff, and not even in the 11th hour. This was a fairly easy problem to deal with in the grand scheme of things. The next one will be a lot tougher, and not likely to be solved ahead of time. I feel we have come to a crossroads where America is leaving the traditional “American Dream” and transitioning to Marxism and class warfare. America is a broke 18 year old college student, who earns $25,000 a year, but spends $35,000 a year. They already maxed out the American Express to over $150,000 and now they want more. Yes… in the back of their minds they know it is a problem, the bank might come and repo their car, however the only thing the 18 year old wants is that brand spanking new iPhone 5, a new iPad 4th generation with Retina Display and that new Mac Book Pro, because that is what their friends have and he cannot afford to be seen in Starbucks with a 2 year old HP Laptop. As a parent, when do you say enough is enough? When is it time to smack some sense into your child? Or do you cuddle them until before you know it the kid says I don’t care, files for bankruptcy (US Gov’t Default) and you are stuck holding the bag and your retirement now means working as a greeter at Walmart for the rest of your life? The time to being oblivious is over, and it is important, no critical for the 300 million plus US Citizens to start paying attention to how Congress and the White House are spending their money.